As Toronto Mayor Rob Ford enters his third day in hospital for a tumour, questions remain how the city's mayoral race will continue without him. As Toronto mayor Rob Ford enters his third day in hospital to assess a tumour, questions remain over how the city's mayoral race will continue without him. Ford was diagnosed with a tumour at Humber River Regional Hospital and was moved Thursday, a day after news of his condition broke, to Mount Sinai Hospital for more followups and treatment. Dr. Zane Cohen, a colorectal surgeon at Mount Sinai and the lead physician on the mayor's clinical team, said Thursday night that the team is in a 'holding pattern' pending the results of a biopsy. Getting the results could take up to one week, and Cohen said it remains unclear how long Ford will remain in hospital. Coincidentally, the mayor's hospital stay is overlapping with the deadline to decide whether to run for mayor or council. The discovery of a tumour in his abdomen raises multiple questions about whether the mayor is fit to campaign, or to return to work at all. Will a Ford be on the ballot for mayor? Ford has until 2 p.m. ET on Friday to decide whether he wants his name to remain on the mayoral ballot. If he doesn't withdraw before the deadline, voters can cast ballots for him, whether he is healthy enough to resume the office or not. If Ford wins but is unable to perform his duties, they would fall to the deputy mayor in the new term. 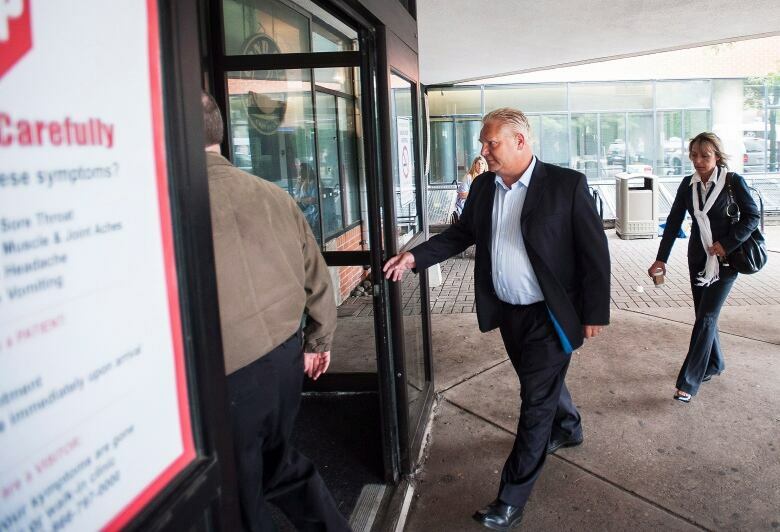 A city spokesman on Thursday said Ford had not asked for any time off. Another 2 p.m. deadline on Friday is for additions to the mayoral candidates list. Doug Ford, a city councillor and his brother's campaign manager, is rumoured to be interested in adding his name. Coun. Ford has neither confirmed nor denied his intention, though. CBC Toronto city hall reporter Jamie Strashin appeared on CBC Radio's Metro Morning show Friday to talk about the political implications of the decisions facing the Ford family. He said some have asked why the city doesn't push back the Friday deadline given Ford's health situation. "It's a question of logistics," Strashin told host Matt Galloway. "The city has to print these ballots long ahead of time so if your name is on the ballot after two o'clock today, it will remain on the ballot no matter what." Strashin said a scenario in which Doug Ford steps into the race for mayor is not far-fetched. "It's completely plausible that he could put his name on the ballot," said Strashin. "Doug Ford has mused about higher office many times. It's definitely something that the Ford family would contemplate. Their legacy and the family name is very important to them." Whatever happens, there will be at least one Ford name on the municipal ballot. Mike Ford, the mayor's nephew, is one of 16 candidates running in Etobicoke North, Ward 2. It is the ward the mayor represented, starting in 2000, before he was elected mayor. Coun. Ford has represented the same ward since 2010. Speculation, however, is that Mike Ford could retire his campaign to let the mayor run in the ward if he is unable to campaign for mayor. In that case, Ford would retain a voice at council by winning an election in which he has much healthier support — he last won his seat there by an approximate 50 per cent margin. Ford opponents Olivia Chow and John Tory participated in a planned debate as the news of Ford's hospitalization was just emerging. There are debates scheduled all throughout the weekend as well. And although Chow cancelled a planned news conference on Thursday morning, she said the debates, as well as the campaign, should go on. "I don't think we should stop the campaign. The vote is coming up in October," said Chow on the CP24 television channel. "I think it should continue." There have been previous debates when the mayor was not present, continued Chow, so why should they stop now? Despite this, Strashin said the campaign has taken a "quasi-pause" as candidates wait and see what decision the Fords will make Friday. He said if either Ford doesn't run for mayor, it will alter the dynamic of the campaign. If there's a Ford-free mayor's race, voters will be forced to take a closer look at the policies of top contenders Tory and Chow. "You take ford out of the equation, and you're just left with these two candidates and it really becomes an election of ideas," said Strashin. Voters head to the polls on Oct. 27 to vote for both council and mayor.